Firearms are dangerous and should be placed in a secure gun cabinet, but you don't want to sacrifice design for safety. Lodge Craft's wide selection of wooden gun cabinets is the perfect meld of great looking design and excellent safety. 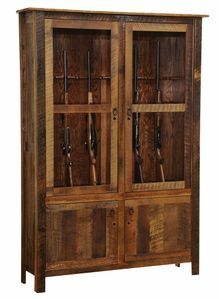 Our gun cabinets come in both Cedar and Barnwood, which gives you a beautiful rustic decor with plenty of viewing space to show off your collection. You won't find quality like this in those chain stores, we're one of the few to who still live and love that rustic lodge and cabin lifestyle. Don't let these amazing furniture pieces pass you by and order one today.